Just as the device appeared on popular benchmarking app – GeekBench, HTC’s unannounced device has also appeared on GFXBench, complete with some new information about the display. Rumors point to an HTC U11 Plus model running the latest version of Android – 8.0 Oreo. There’s also going to be a 6-inch display with a 1440 x 2880 px resolution, which calculates to a taller 18:9 display. This could be HTC’s re-release of the HTC U11 with a display that fills out body and reduces the size of the bezels. Considering that the LG V30 shares an identically-sized footprint to the HTC U11, the 6-inch display size should be a nice fit for HTC’s mystery device. 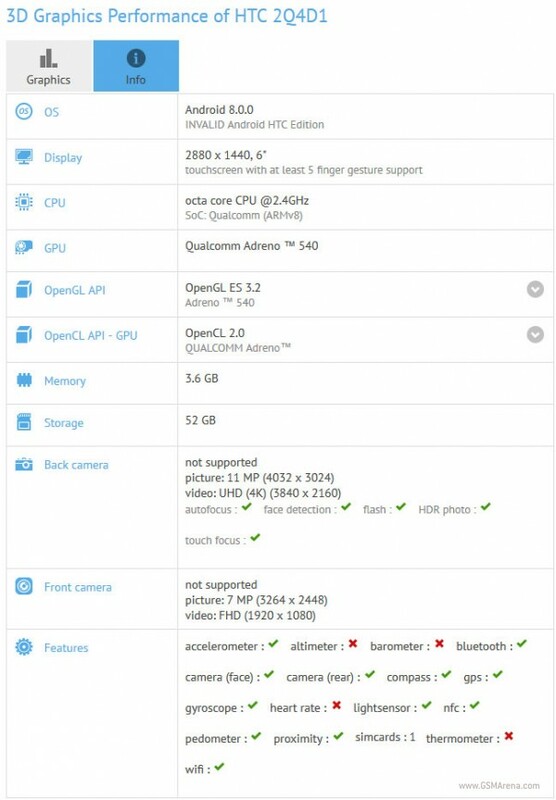 The benchmark result also shows a Qualcomm Snapdragon 835, Adreno 540 GPU, 4GB of RAM, and 64GB of onboard storage. Camera-wise, the unknown device shares the same specs as the HTC U11: a 12MP main camera and an 8MP front-facing one. An invitation for a November 2 event had already leaked a couple of days ago, which sets the date for HTC’s unveiling of the rumored HTC U11 Plus at HTC’s headquarters in Taipei. This dumbass aspect ratio once again. A company whose phones were once known for their sound quality.